The Fall, 2015 issue of the Municipal Leader is full of interesting people. You will meet President Chris Goertzen, appointed to lead the organization just last July. 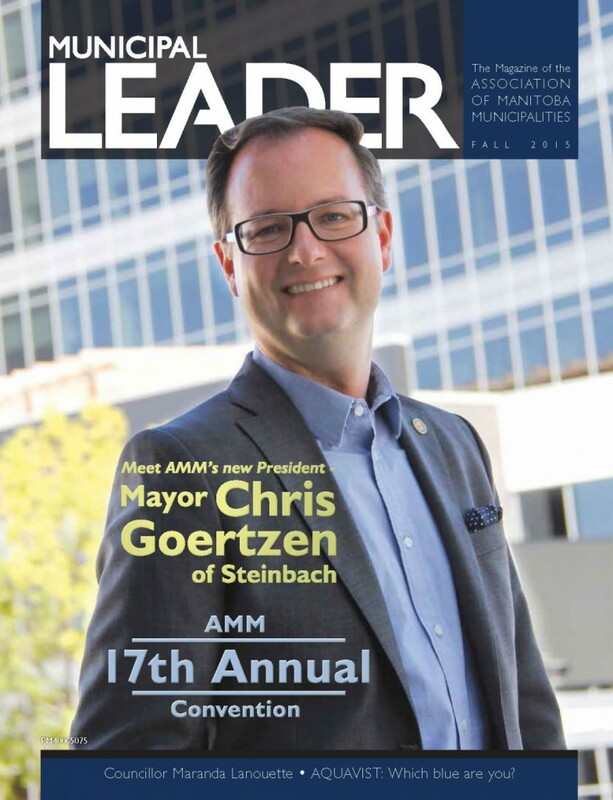 As the youngest Mayor ever elected in Steinbach, Manitoba’s third largest city, as well as the youngest president to serve the AMM, Chris is definitely breaking new ground. You will also meet Ste. Anne Councillor Maranda Lanouette, whose remarkable story of courage and perseverance should encourage ANYONE who dreams of running for council to just do it! Finally, Manitoba has had a new Ombudsman since May 2015, who you will hear more about not only in the Leader, but at the upcoming AMM 17th Annual Convention. And speaking of Convention, we have all the details – the agenda, the keynote speakers, the displayers, the Gala, and a sneak preview of what is sure to be the hottest ticket in Brandon – the AMM Provincial Leaders’ Debate.